Under Linux, how do I find out which process is using the swap space more? Run top then press OpEnter. Now processes should be sorted by their swap usage. It is not possible to get the exact size of used swap space of a process. Top fakes this information by making SWAP = VIRT - RES, but that is not a good metric, because other stuff such as video memory counts on VIRT as well (for example: top says my X process is using 81M of swap, but it also reports my system as a whole is using only 2M of swap. Therefore, I will not add a similar Swap column to htop because I don't know a reliable way to get this information (actually, I don't think it's possible to get an exact number, because of shared pages). It's not entirely clear if you mean you want to find the process who has most pages swapped out or process who caused most pages to be swapped out. For the first you may run top and order by swap (press 'Op'), for the latter you can run vmstat and look for non-zero entries for 'so'. I did notice this thread is rather old, but if you happen to stumble upon it, as I just did, another answer is: use smem. The top command also contains a field to display the number of page faults for a process. The process with maximum page faults would be the process which is swapping most. For long running daemons it might be that they incur large number of page faults at the beginning and the number does not increase later on. So we need to observe whether the page faults is increasing. Standard usage is script.sh to get the usage per program with random order (down to how awk stores its hashes) or script.sh 1 to sort the output by pid. I hope I've commented the code enough to tell what it does. This is exactly same than lolotux script, but without any fork to grep, awk or ps. This is a lot quicker! And as bash is one of the poorest shell regarding performance, a little work was done to ensure this script will run well under dash, busybox and some other. Then, (thanks to Stéphane Chazelas,) become a lot quicker again! 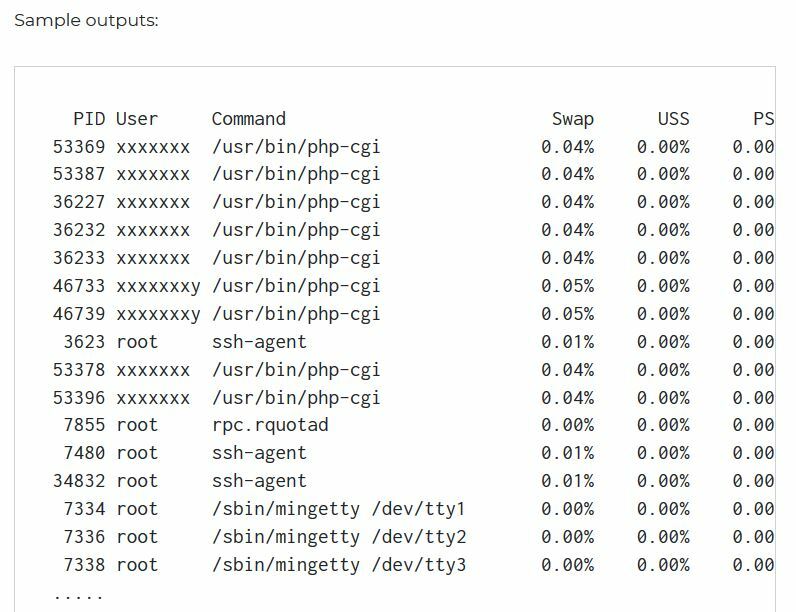 printf "PID: %9d  swapped: %11d KB (%s)\n" $PID $SUM "$PROGNAME"
Don't try echo $PROGNAME without double quote on sensible system, and be ready to kill current shell before! As this become a not so simple script, time is comming to write a dedicated tool by using more efficient language. I suppose you could get a good guess by running top and looking for active processes using a lot of memory. Doing this programatically is harder---just look at the endless debates about the Linux OOM killer heuristics. Swapping is a function of having more memory in active use than is installed, so it is usually hard to blame it on a single process. If it is an ongoing problem, the best solution is to install more memory, or make other systemic changes. On MacOSX, you run top command as well but need to type "o" then "vsize" then ENTER. Also, use a good tool like htop to see which processes are using a lot of memory and how much swap overall is being used. iotop is a very useful tool. It gives live stats of I/O and swap usage per process/thread. By default it shows per thread but you can do iotop -P to get per process info. This is not available by default. You may have to install via rpm/apt. The output of this version is in two columns: pid, swap amount. In the above version, the tr strips the non-numeric components. In both cases, the output is sorted numerically by pid. What does the SWAP column in top command stand for? Linux: How do I get the swap used by a process?